On November 3, 2015, after a furious couple of days uploading images and finishing some content, we finally went public with U2Songs.Com. It feels like we’ve been at it much longer but today is the one year point since we relaunched, and we have had an amazing year, so today we’re taking a moment to look back. Although celebrating a first birthday, it’s been 22 years now since we first launched the site, initially at a variety of free providers, and later at U2Wanderer.Org. The first development work on U2Songs.Com actually started in August 2011. And for four years we worked away in the background getting things ready. We are still working on rebuilding the discography as we re-scan every item in our collections at a higher resolution allowing us to provide better images of items than ever before. We’ve made it through most of the singles focusing on CD and 7-Inch releases so far, but still have lots of scanning to go. Last November when we launched U2 were in the last days of the #U2ieTour. The attacks in Paris had not yet happened. And there were rumours that the tour would continue in the Spring, hopefully with a new album, “Songs of Experience”. We know now that that didn’t happen, but we will look back at a few things that did happen in the last twelve months. Skool Daze Feedback: Harry Kantas took a look back at U2’s earliest days at Mount Temple, including a look at the Mount Temple Magazines from that year. Included at interviews with Neil McCormick and Frank Kearns about those days, and we were even able to share an image of U2 performing at Mount Temple that had never been shared on the internet before. Shadows and Tall Trees: The Alternate Cover to Boy Aaron and Don take a look at the North American release of Boy and the cover that was used for those markets. Included is an interview with the photographer of the cover, Sandy Porter, as well as images of alternate ideas for the cover which were not used courtesy of Sandy Porter. Every Artist is a Cannibal: U2’s Use of Samples in their Songs: Tim C takes a look back at U2’s songs that have used samples and gives us a fascinating glimpse of the songs they used in the creation of their own along the way. Wandering Through Fan Clubs: Cindy takes a look at fan clubs run by other artists, and what they offer in comparison to U2’s own club run by U2.com. If you are only a member of U2.com it’s a chance to look at what other artists offer. #U2ieTour Musical Journeys: Aaron takes a look back at the music used throughout the #U2ieTour at the end of the second leg. The albums played in full before the pre-show, the pre-show music, the songs played after the show. It’s all here. Links are also included to similar articles we produced for the U2360 tour and the Vertigo tour. Introducing the Wolves: Remember that audio collage prior to the start of “Raised by Wolves” during the #U2ieTour? Tim C took a look at the piece of audio that introduced the song live in concert and tore it apart, looking at the songs included, the audio clips that were mixed into the song and how it all ties to the song. We have an extensive discography, videography and a detailed list of lyrics throughout the site. But one of the things we always wanted was a place where we could tie things together and look at different aspects of U2’s career. Last year at Christmastime we were writing an article about Christmas songs that U2 had participated in, and the idea for the column was born. The History Mix was the name of a short promotional video that looked back on U2’s career that was done for The Best of 1990 – 2000, and we liked the name. It’s our opportunity to mix and remix pieces of the site to present a story. We’ve had a column approximately every two weeks throughout the year, including this one, and we’ve covered a wide range of topics. Want to know about those city specific shirts produced throughout the #U2ieTour? What EPs have U2 produced throughout their career? Where did the cover image for the Passengers album come from? What work has U2 done with Gavin Friday? Sinead O’Connor? Who are the producers being mentioned in conjunction with Songs of Experience? What kind of collectibles were being released before Boy was released? We hope to keep the column going as we continue to work on the site. Its our opportunity to look at the career of U2 and pull together aspects of their catalog, their chart positions, their merchandise. We’ve published a lot of news over 22 years of working on a U2 site. We’re happy with the new home in that it makes posting news much easier than before, and also allows us a new level of organization. We’ve introduced a couple of news sections that you can search at any time for the latest news on a specific topic. U2ieTour: Stories specific to the recent #U2ieTour, both new material published here first, as well as stories first published at U2Wanderer.Org such as our look at the books thrown during U2’s performance, and the confetti launched from the skies. #U240: Our detailed look back in the 40th year of U2 at their earliest days and our celebration of this milestone. The History Mix: The full list of columns that we cover above. Upcoming Releases: Here we keep a running tally of upcoming and recent releases that will feature U2. This includes links to current news stories at the end of the page. Unreleased Gems: A list of news stories where some project that has been mentioned and never released are collected. U2’s work on the X-Files, J.Lo, Swizz Beatz and Patti LaBelle working with Bono and more. The site isn’t all about news. Our focus since we launched in 1995 has always been the discography of U2. Not just their albums and singles, but we look at the promotional releases, solo projects, various artists compilations, soundtracks and more. We are still actively working on the discography, trying to complete a massive re-scanning of all the items in our collections. But a look back at the last 12 months in the discography? We added 2560 photos to the discography this year in addition to all of the images available when we launched. The focus has been on U2’s singles, and many are complete when it comes to scans of the 7-Inch singles and CDs. We are moving into scans of albums next and cassettes in general. We have added 71 new discography entries this year. That brings our current total to 768 unique discography items. We have added the ability to sort catalog section by type, which has greatly increased load times. We plan to include more flexibility in the near future. We have 3860 individual items in the U2 catalog at this time. This is a unique pressing of an item, such as the Canadian pressing of Boy on vinyl. This number is for U2 items only and we have yet to do a full catalog upload for various artists items. This year we’ve also been able to uncover a few older items that we didn’t know belonged in U2’s discography. We’ve also done a lot of investigation into some songs which we believe we have conclusively proved do not have any U2 content. A few of these have puzzled us for years, so it’s been nice to have some closure on these. Implementation of a “Did You Know” section in the lyrics which allows us to provide trivia about any release, give details on specific mixes and how they differ, and more. You can also see what releases a particular song appears on right from the lyric page which is helpful for figuring out if you own an item that the song appears on or not. One of the biggest new improvements to the site is the launch of our videos section. It’s new content for the page, and in the past has not had a home. The section details each of U2’s commercial videos for songs that have been released over the years. For now it stops at just U2’s songs but we have some solo and other listings waiting in the wings for a quiet moment to finish. Where available the video page will embed the actual video being discussed. We monitor these links twice a month to ensure they are up to date and working. Detailed information about each video is presented, and for each video we’ve included a map to show you locations around the globe where the videos were filmed. Finally there are links to items in U2’s videography where the videos can be found and screen grabs from the video. This section like the discography goes beyond just the main versions, attempting to catalog all the variations of the videos that we know about. Information on these videos can also be accessed through the discography on individual release pages. We’ve been active on Twitter for years. As part of the relaunch we also set up space on Facebook. We suggest you follow us on both if you can, as we sometimes don’t post the same content in both locations. 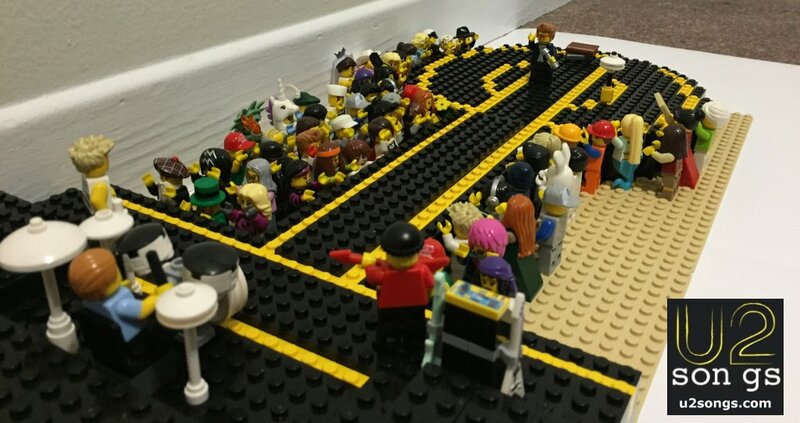 While we mostly use both for posting news and links to stories, we also use Twitter frequently to communicate, use both for contests, and quite often post random photos of collectibles and a series of “Lego U2” images on both. A variety of paper goods such as NLOTH and #U2ieTour stickers. And thanks to the U2.com moderators, we gave away a set of this years u2.com gifts, the lithographs. We’ve promised that our next contest will be on Facebook. But we’ll have another on Twitter soon as well. Keep your eyes on both for a chance to win. Not your typical History Mix this time out, and we appreciate it if you made it this far. I’d like to extend a big thank you from all of the staff here at u2songs.com and all that contribute articles. Your support and encouragement over the last year (and the 21 years before!) has been greatly appreciated.